www.pmjdy.gov.in - Are you searching for statistics of Pradhan Mantri's Jan Dhan Yojana? Than you can find the statistics of Jan Dhan Yojana below. We have summed up total number of Bank accounts opened under prime minister's Jan Dhan Yojana below with information like number of total accounts opened (rural and urban), number of rupay debit card, balance in accounts, and number of accounts with zero balance. 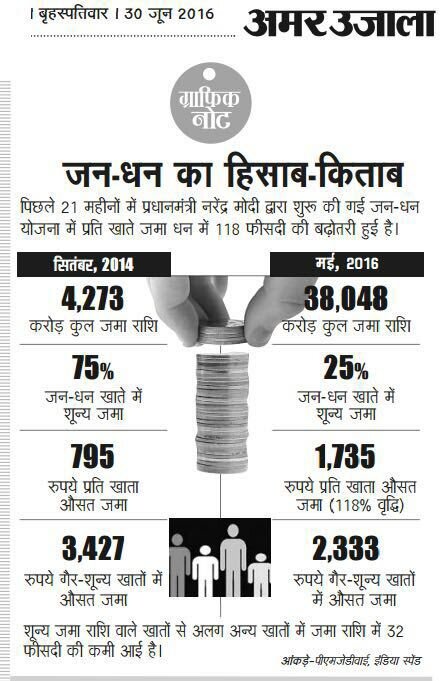 Update :- (30th June, 2016) With in start of Jan Dhan Yojana, Jan dhan yojana has increased deposit money up to 118%. Only 25% of account has Zero balance, Total amount deposited in Jandhan Account is Rs.38,048 cr. Average Rs.1735 are deposited in Jandhan accounts. Source - Amar Ujala. Update :- on the completion of Jan Dhan Yojana's 1 year operation, Total of 20.38 crore bank accounts has been opened in jan dhan yojana and total Rs.30,638.29cr has been deposited in Jan Dhan Accounts. Update :- As per the News, On 14th October, 2015, Deposits in Accounts Under Jan Dhan Scheme Cross Rs. 25,000 Crores (From 22k cr in August), and zero balance accounts reduced to less than 40 per cent. 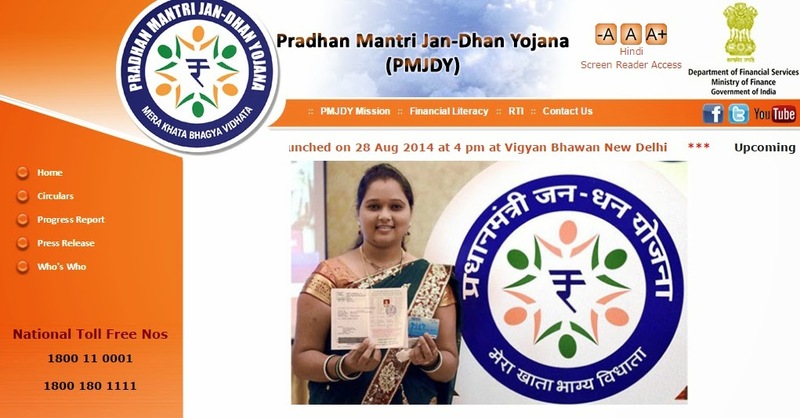 Update:- On 28th August, 2015, Jan Dhan Yojana has completed total 1 year. Below is statistics, total achievements of Jan-dhan yojana. Update :- On 2nd April, 2015, PM Narendra Modi Announced that Rs 14,000 crore deposited in Jan Dhan accounts. Speaking at event of RBI, he emphasized to increase more transactions in jan dhan accounts. Earlier, when on 15th august prime minister had announced Jan Dhan yojana, they had given target to banks was 7.5 crore in 5 months (by January, 2015). But the below statistics are quite surprising for all of us (even for government officials). Yes, if we believe to official figures, with in 2 month of span, 7 crore new bank accounts have been opened so far, collecting deposits of more than Rs 5000 crore. Below are more statistics of Jan Dhan Yojana. Note :- This statistics are as on 4th November, 2014.
you can check state wise statistics of Jan dhan yojana here. Earlier, In india we hardly opening 1cr new bank accounts every year, but because of this scheme, now every india will have bank accounts and they will get government scheme benefits direct in their bank accounts. For jan dhan yojana, Finance minister Arun Jaitley is soon going to review this statistics and they will redefine the targets for banks (as per sources, the new target will be double of this ,15cr accounts by January, 2015). The success of PMJDY is the benefits of account opening associated with this scheme. Yes, the account holder gets 'interest free' overdraft facility of Rs 5000 + 1 Lac of Accidental Insurance + Kisan Credit Card. Keep visiting us for more updates on jan dhan yojana and other government scheme's information.